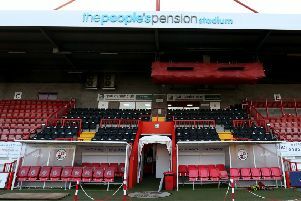 Crawley Town head coach Gabriele Cioffi is looking to seal the three points needed to stay up this afternoon at Yeovil Town. He understands some fans are not happy with him after Reds suffered four successive defeats and have slipped down to fourth from bottom and are just six points above the relegation zone. But he wants to clinch the necessary points as soon as possible so the club can start planning for a better season next year. Cioffi points out this season was unusual because he only took over in September inheriting another head coach’s squad (Harry Kewell). He said: “We are going there with the confidence of good performances and the will and desire to match performances and result. “This is the game; we want to close this season as soon as we can. “Everyone knows this hasn’t been a normal season so we put our heads down, hard work and we are ready to challenge Yeovil. Cioffi accepts responsibility for the poor results but calls on fans to recognise the problems he has faced. “I understand the frustration of some of the supporters because they follow their emotions and that’s fair enough: their emotions say their team is losing and as the supporters you are upset with the person in charge so myself! “We are losing because of individual mistakes or not getting chances. “But that’s part of the job and I accept the blame is on me.